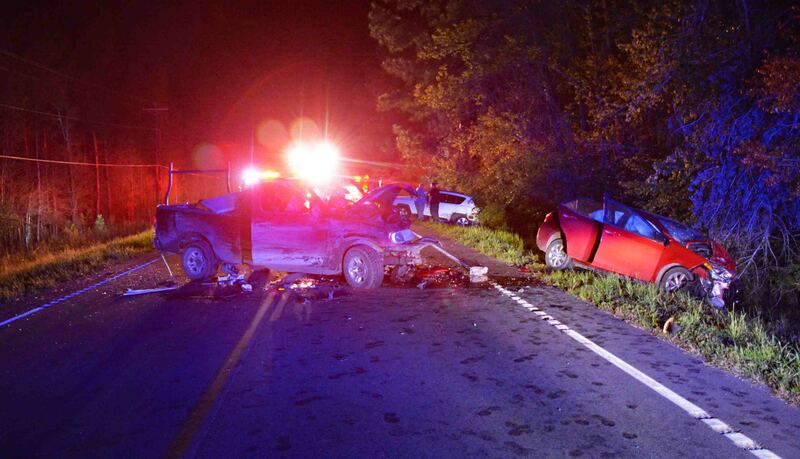 Incident # 19-02182 – Six people were injured, two critically, in a three car head-on collision in the 15000 block of Cottageville Hwy. (US Hwy 17-A) just south of McDanieltown Road near the Edisto River Saturday evening 30-March. 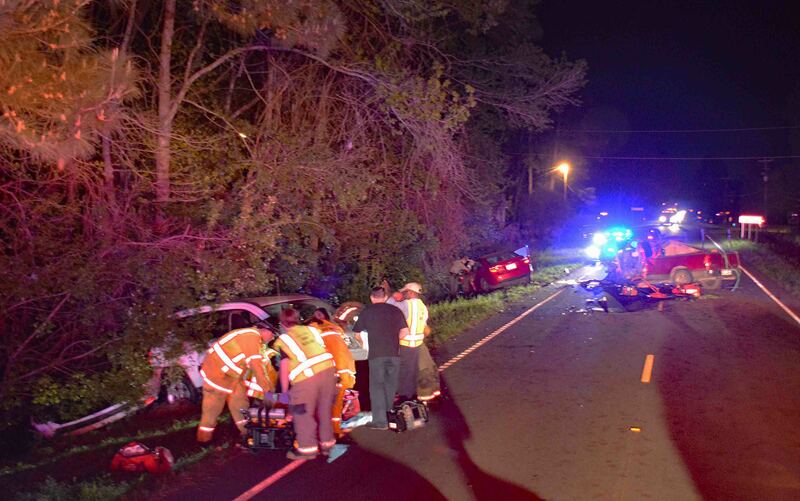 At 20:13, 9-1-1 Operators began receiving multiple reports of the motor vehicle crash reporting one child was not breathing and a second patient was trapped in the wreckage. Initial reports indicated nine people were hurt, however only six required ambulance transportation from the scene. Fire-Rescue responded with four ambulances, two Engines, a Heavy Rescue unit and three Paramedic First Reponses units. Fire-Rescue Medic 9 was the first unit to arrive and found an off-duty nurse performing CPR on an unresponsive 4 year old child. An off-duty Georgia Paramedic also stopped and assisted with caring for the injured. He had triaged all of the patients prior to Fire-Rescue arriving and provided the first units with vital patient information. Bystanders had removed the 4 yr. old girl and several other occupants from the Toyota. 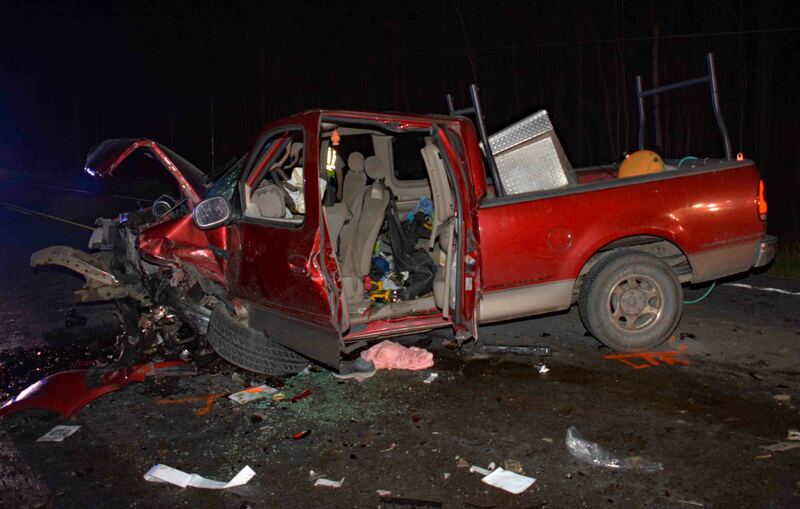 A southbound Toyota Corolla and a northbound F-150 Pickup Truck had collided head-on causing heavy damage to both vehicles and trapping the male driver of the pickup truck. A Jeep Compass was also struck and found off of the roadway on the southbound shoulder. One occupant of the Jeep was injured and two other occupants did not sustain any injuries. The first Firefighter-Paramedics continued resuscitative efforts on the four year old, including IVs, medications and advanced airway management. Through God’s grace, they successfully revived the child prior to departing the scene. Early CPR by the bystanders is credited with saving her life. Medic 9 transported the girl with additional Firefighter-Paramedics on board to assist with her care directly to the Pediatric Trauma Center at MUSC in Charleston. She remained in critical condition. Engine 9 and Engine 19 used rescue and hand tools to free the unconscious driver of the pickup truck. The C.A.R.E. Flight medical helicopter had been requested and landed in a field near the scene of the accident. The male driver of the pickup truck was transported in Fire-Rescue Medic 19 to the meet with the helicopter crew. He was flown by C.A.R.E. Flight to the Trauma Center at MUSC. 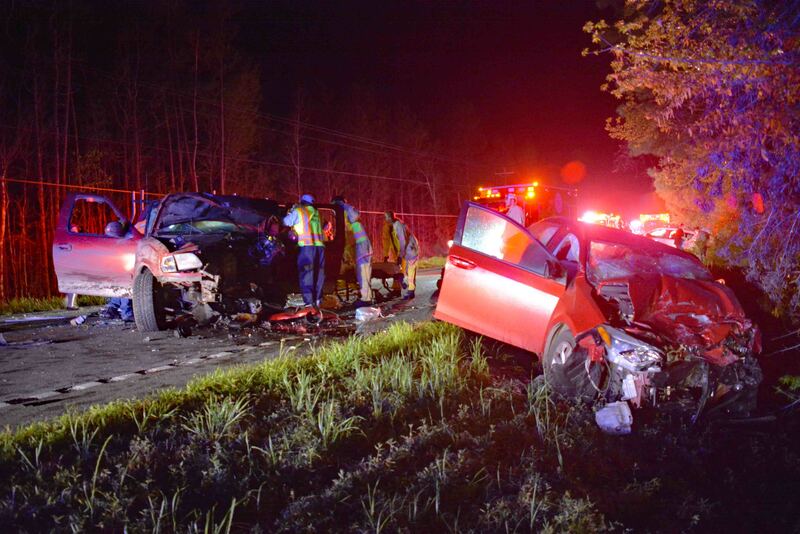 An 8 yr. old girl who was a passenger in the Toyota, suffered multiple traumatic injuries. The adult female driver of the Toyota also suffered multiple non-life threatening injuries and a five month old infant in the car was also injured. All three were treated at the scene, then transported emergent in Fire-Rescue Medic 1 to the Trauma Center at MUSC, also with additional Firefighter-Paramedics on board. An adult female passenger in the Jeep was transported by Fire-Rescue Medic 26 to Colleton Medical Center in Walterboro. The wreckage and debris blocked the entire highway, causing traffic to be rerouted for over five hours. The SC Highway Patrol’s MAIT Team responded to the scene and SCHP is handling the investigation of the accident. Cottageville Police and the Sheriff’s Office initially assisted with traffic. Engine 9, Engine 19, Medic 1, Medic 9, Medic 19, Medic 26, Battalion 1, Car 112, Car 118 and C.A.R.E. Flight responded. Battalion Chief Brent Dalton served as Incident Commander.